Overview : The PS3Key is Team WiiKey's first product in the PS3 market. They decided to release a clone of the PS Jailbreak, a USB Plug and Play solution that installs in seconds without any need to open up the PS3. It will not break your warranty seal and is compatible with all PS3 models, both Fat and Slim. Easy-to-use software for backing up, managing, and playing games from external USB Hard Drive. The PS3Key will supports installing homebrew application on PS3 and external USB media. THIS DOES NOT WORK ON FIRMWARE 3.42 OR ABOVE UNTIL A NEW EXPLOIT/METHOD IS FOUND! IMPORTANT: The console must be completely switched off before using PS3Key. For fat versions, use the switch at the rear. For slim versions, simply remove the power cable. This is extremely important for the process to work correctly when you start the console. 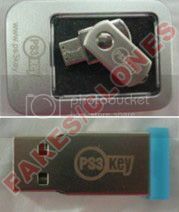 Optionally PS3Key can be supplied with an "open" firmware which does not support backup loading. Users would then have to download a firmware update for PS3Key to get full functionality. Quality/Usability : Also read our AVRKey review. Some are probably saying to themselves "Oh great..another clone to hit the PS3 scene". Yes, that is true but this from a team that has a great track record and been in the video game scene. The name PS3Key kind of gives it away. Want to take a guess? Still cant figure it out? The team behind PS3Key is none other than WiiKey...the same people behind the WiiKey modchip and WiiKey Fusion for the Wii. So you know they won't be leaving us gamers high and dry. The PS3Key comes in an anti-static bag and on this bag is also a yellow sticker. This sticker is your serial number and verification string. This allows you to verify and validate if the PS3Key that you purchased is authentic. For the verification string, it must be typed as shown. Capital letters must be typed with CAPS and lowercase letters must be lowercase. Failure to do so will give an error message. The team is serious about combating PS3Key clones. The PS3Key is housed in a metal casing that looks exactly like PS Jailbreaks. There is also no writing or logo on the housing to prevent any problems with distribution and measures approximately 1.25" (length) x 0.50" (wide). On the end of the PS3Key is a blue rubber cap. This protects the board from being exposed and prevent dust and other particles from entering as well as softens the brightness of the LED lights. The PS3Key dongle is running on ATMEL MEGA32U2 (ATMEGA32U2) and is upgradeable via USB port. Installation is simple. Since the encrypted bootloader and files are preinstalled, just insert the PS3Key into the USB port of your PS3. The files installed the PS3Key are proprietary. Getting it to run the exploit is the same as all other Jailbreaks and you can remove it after its been loaded successfully. Insert PS3Key into a USB port on the PS3. In order to make sure the PS3Key dongle worked flawlessly, I had to uninstall all my homebrew applications that I had originally installed. To install applications or any homebrew applications, you will need to download and save the .pkg files to a USB drive such as thumbdrive or harddrive. To install, simply insert USB drive to the PS3 and navigate to "INSTALL PACKAGE FILES" on the XMB under GAME. Select the file you want to install by pressing X and it will automatically install the file. All applications installed and loaded without any problems. There are no other files or programs available to download from www.ps3key.com. But it seems PS3Key is in the process of making their own backup manager known as PS3Key Loader. However, upon loading this, there is nothing except for a message saying "The key has been turned..". Inserting a different Jailbreak device and running this file resulted in a failure. So it seems that PS3Key Loader checks to see if the PS3Key is inserted. By using this PS3Key update you agree to the following terms and conditions. If you do not agree with such terms and conditions; do not use or apply the update. The PS3Key Team grants you a non-exclusive license to use such software with the PS3Key hardware product only; provided your PS3Key hardware product is a genuine product of the PS3Key Team. The update may not work with, or may cause damage to, any non-genuine PS3Key product. The export and re-export of PS3Key updates are not controlled by the United States Export Administration Regulations. As such, software may be exported or re-exported to Cuba; Iran; Iraq; Libya; North Korea; Sudan; or Syria or any country to which the United States embargoes goods. DISCLAIMER OF WARRANTIES: YOU AGREE THAT THE PS3KEY TEAM HAS MADE NO EXPRESS WARRANTIES TO YOU REGARDING THE SOFTWARE AND THAT THE SOFTWARE IS BEING PROVIDED TO YOU "AS IS" WITHOUT WARRANTY OF ANY KIND. THE PS3KEY TEAM DISCLAIMS ALL WARRANTIES WITH REGARD TO THE SOFTWARE. LIMIT OF LIABILITY: IN NO EVENT WILL THE PS3KEY TEAM BE LIABLE TO YOU FOR ANY LOSS OF USE; INTERRUPTION OF BUSINESS; OR ANY DIRECT; INDIRECT; SPECIAL; INCIDENTAL; OR CONSEQUENTIAL DAMAGES OF ANY KIND (INCLUDING LOST PROFITS; SLEEP; SANITY) REGARDLESS OF THE FORM OF ACTION WHETHER IN CONTRACT; TORT (INCLUDING NEGLIGENCE); STRICT PRODUCT LIABILITY OR OTHERWISE; EVEN IF THE PS3KEY TEAM HAS BEEN ADVISED OF THE POSSIBILITY OF SUCH DAMAGES. 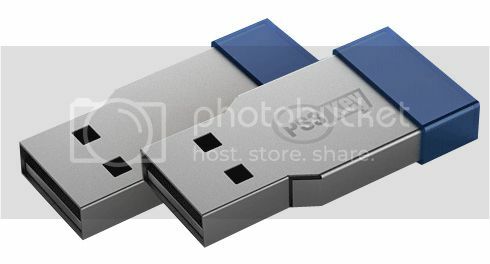 Just inserting the PS3Key into a USB port of the computer causes it to be recognized but nothing really happens nor does it show up as a removable drive. All you hear are dings. But I inserted and removed it 4 times in a row within 10 seconds and a pop up did show up on my Windows Vista saying that the Generic USB Device has been installed successfully and can be used (wont show up all the time..only when first initiated). Performing this method will put the PS3Key into Update Mode and the both blue and red LED will be lit (purplish look with cap on). This will now allow you to update the PS3Key with any new files the team has released. I know some gamers are wondering if you can flash PSGroove hex files onto the PS3Key. I haven't tried it myself but Team PS3Key has informed me that you can erase the files on the PS3Key and install something else (such as PSGroove), but then you would not be able to put PS3Key code back onto it again. So if you're looking to buy a PS3Key to load your own files, I suggest not doing so. If you don't care about future PS3Key updates and want to install HEX files, you can install HEX files onto PS3Key by erasing the PS3Key bootloader using the ATMEL programming software. Just remember that it's a one-way process and you won't be able to make it into a PS3Key again afterwards! Overwriting PS3Key's proprietary file would be pointless since you lose all future features and updates that PS3Key would release in the future. There are plenty of other USB development boards at a cheaper price if you wanted to load PSGroove files such as AVRKey. AVRKey is also developed by Team PS3Key but the difference between the two is that AVRKey gives you the ability to load your own files where as PS3Key has it preinstalled and both have the same hardware. PS3Key updates are protected with TEA Encryption and not serial number specific. However, its best to download directly from PS3Key's website so you know that the files are not tampered with and you have full support from the PS3Key team, if needed. Connect PS3Key to your PC in update mode. To do this, simply insert it and remove it a few (3-4) times in until both of the LEDs (both red and blue...looks purplish) light up at the same time. Choose "File" and "Open" and then select the update file (i.e. ps3key_v2.upd). Click "Update Now" at the top of the screen. This will only be active when the PS3Key is connected to your PC and both the red and blue LEDs are lit. That's it! The progress bar will indicate when the update has been applied. It is now safe to remove PS3Key from your PC and continue to enjoy using it with the new features! * Since my computer is running Windows Vista, for some reason, it didnt want to install the updated file. The progress bar didnt do anything (like the image above). But I decided to right click and choose "Properties" on the application itself (.exe) and clicked on the "Compatibility" tab and enable "Run this program in compatibility mode for: "with Windows XP (Service Pack 2)". You may also need to go under "Privilege Level" select "Run this program as an administrator". This is when the program would actually load the file. It may not be required but if you can't get it to load the new file, this is an option. There are two versions of PS3Key. There is a ATMEL version and SiliconLabs version. ATMEL-based PS3Key require the use of PS3Key Updater to update the PS3Key. If you have a SiliconLabs-based PS3Key (4th digit of the serial number is a 4 or 5) then you do not need this application as it is possible to drag-and-drop the update directly onto the dongle in Windows. If you have already entered your serial number, you can check YOUR PS3KEYS and it will tell you which version you have. If you have not entered your serial or never got one (you should contact the site you purchased from and get one), the only way to find out is if you remove the board. Unfortunately, I do not know how the SiliconLabs (Silabs) version looks like. I insert my PS3Key and nothing happens. No lights, nothing! What's wrong? Unfortunately, a small number of PS3Keys (estimated at less than 1% of the total produced so far) were shipped with a little less insulating tape than they should have been. This is causing the metal contacts on the bottom of the circuit board to short circuit on the metal case. This isn't a fatal short circuit, your PS3Key has not been damaged. Conclusion : Overall, the PS3Key USB PSGroove Jailbreak ATMEL looks very sleek. With Team WiiKey showing their continued support and products on the Nintendo Wii, we will see the same commitment on the PS3. They have demonstrated the capability to create and compile their own codes and are most than likely able to create a new their own version of the backup manager. Those looking to install their own files, I suggest not purchasing the PS3Key as you lose all features and future updates that PS3Key has to offer. Instead, look into purchasing the AVRKey which is also from the PS3Key team but AVRKey lets you install your own files. If you purchased a PS3Key and it did not have a yellow sticker on the anti-static bag, contact the seller you purchased it from and ask for it. If they can not supply it, you more than likely received a clone/fake (PS3Key do not have logo printed on them and caps are thick blue..not thin teal caps). Also, the image below shows two versions of fakes. These were NOT made by PS3Key nor ever was.